An open standard, free framework for holistic view and for building common language and mutual understanding among all key actors in startup ecosystem, about how great companies are created anywhere in the world from "idea to product, to growing business" and from "talent to team, to real organization" in balanced manner. Download in high resolution | See version history over time. Startup Key Stages by Startup Commons is licensed under a Creative Commons Attribution-ShareAlike 4.0 International License. Please share and help spread the knowledge. In addition to innovation process from idea to value generating product and market proven business model, startups also need to build a strong and committed founding team and develop both of these together into a real growing business and organization running processes that effectively capture the value created. ​While there are many great resources and self education tools available for product and business development, where most important ones are captured in this framework as well. Much less resources and focus are available to understanding challenges of building a committed team and growing a scaling organization - especially from globally neutral perspective. ​Yet, if asked from professional investors and most professionals in business, pretty much all agree that while business is about people, products and processes - the team ranks as very important, - if not the most important factor. See also: What is a Startup? and formula to business success. ​Questions? Improvement Suggestion or Feedback?​ Please feel free to comment at the bottom of the page or send us a private message via our contact form. ​With this framework, everyone can communicate much faster their relevant development phase, what support is available and be reminded of actions need, to get to the next phase. Few things are as important as common understanding and definitions. Without knowing exactly what specific startup related terms mean, and how they apply to given situations, it's much harder for Business Creation, Ecosystem Development or Providing Support to take place. With startups and startup ecosystems, there are still many terms that are commonly misunderstood or misused and that is exactly why this globally neutral framework have been created as an open standard and shared under creative commons for free use and collaborative improvements by anyone, who have solid ideas to make it better for everyone or need to adjust it for local need. See how others are using the framework. Are you a consultant or an entrepreneur? Need a print versions? Want to make your own changes? Want to translate to another language? Download Startup Development Phases document for free (available in various high quality file formats). Startup Key Stages by Startup Commons is licensed under a Creative Commons Attribution-ShareAlike 4.0 International License. Please share and help spread the knowledge. ​The initial mission of Startup Commons was to find a simple, holistic and global common terminology to talk and describe the various stages of a startup journey. 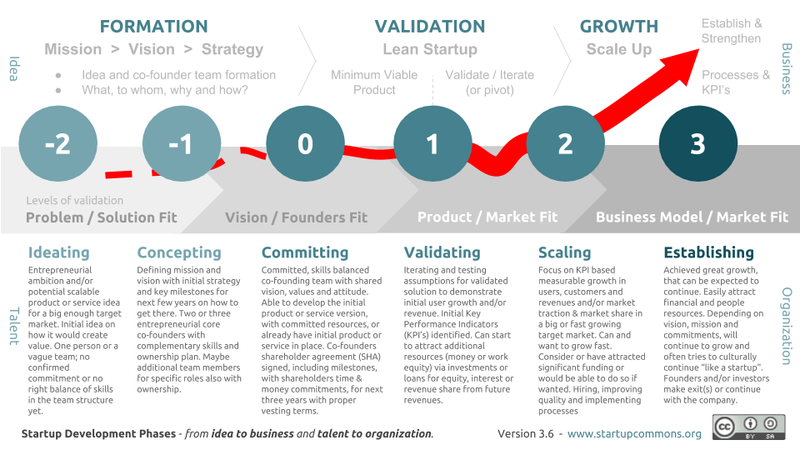 As creators of this tool, having been through these stages many times around the world as serial and portfolio entrepreneurs, and having advised and invested in many other startups at various stages, as well as developed startup support services to support creation and developments, we recognized the need to be able to pin down a description for each of the stages. This iterative development process have taken several years of research, development and iterations to be able to simplify a quite complex phenomenon to a simple enough, high level framework that could be accepted by most of the relevant parties and global experts in this field.